PANAMA BEACH, Fla. (NBC News) – Nature’s fury is on full display after the most powerful hurricane ever to reach Florida’s Panhandle crashed ashore Wednesday. “This hurricane was an absolute monster and the damage left in its wake is yet to be fully understood,” Governor Rick Scott said Thursday. 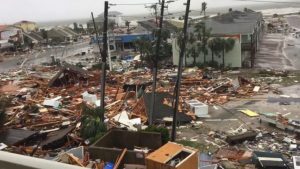 Hurricane Michael hit as a fierce Category 4 storm packing maximum sustained winds of 155-miles per hour. The damage is still being assessed in some of the hardest hit areas. “We are deeply concerned about Mexico Beach, that area and the areas between Apalachicola and Panama City Beach,” says FEMA Administrator Brock Long. Much of the small coastal village of Mexico Beach is in ruins, with homes shredded and debris thrown for miles. Hundreds of thousands of homes are now without power, and at least two deaths have been confirmed.